One of Brisbane's magnificent old homes went under the auction hammer over the weekend. Currently the home of the English Speaking Union, beautiful Palma Rosa at Hamilton was sold to local buyers for $3.715 million, according to a television news report on Saturday night. Apparently, there was action at the auction - and not only in the bidding. The same news story indicated that the auction was delayed because of protests against the sale, and even that police were summoned as a result of items being misappropriated from the property on the day. Palma Rosa (my picture, above) was designed by Italian-born architect Andrea Stombuco and built in 1886-7 on the hill in Queens Rd Hamilton. Stombuco seems to have had a varied and interesting career, stretching from gold-miner to stone-mason and finally architect. He designed several buildings for the Catholic church, including St Patrick's in the Valley, but Palma Rosa has been described as his "most flamboyant" creation. Click here to go to the web pages of realestate.com, where you can see further images of the interior of this lovely property. Be quick though - I don't know how much longer they'll be there. Originally named Sans Souci, it is not clear whether the house was built by Stombuco for his family to live in, or as a speculative investment. 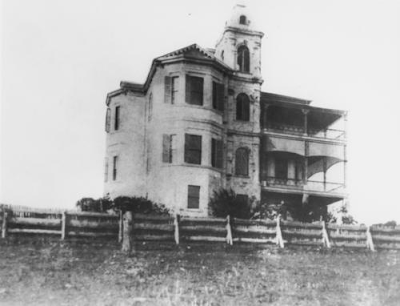 Stombuco's fortunes declined in the years shortly after the completion of the house, and he left Queensland for good in 1891. This is how the house is described in Queensland's Cultural Heritage pages: "Original plans indicate that the sub-floor contained a generous L-shaped dining room, kitchen, scullery, pantry and servant's room; the piano nobile contained a drawing room and library [connected by folding doors] over the dining room, a boudoir and two bedrooms on the east side of the hall, and a main staircase off the vestibule to the west; and the upper floor accommodated 5 bedrooms and a bathroom. The three floor plans virtually replicated each other, and included a generous hall, 10 feet wide, running centrally north-south on each level. Initially, verandahs across the whole of the southern and western elevations were intended, but only sections of these appear to have been built" The house was constructed from sandstone that came from a nearby quarry. As well as being a substantial private residence, this building has had several uses over its 120-year history: it has been converted to flats; a boarding house; a private hospital; a US Army Intelligence HQ during WWII; an art gallery; a reception and function venue and club rooms. It is hoped that the new owners will once again use it as a private residence. What a delightful building, at least from the outside. There are two interesting elements: firstly that the architect chose to use sandstone and secondly that the old photo above shows at least half the house without verandas. Is the building protected at all? Yes, it is heritage listed. There are reports that the completion of this building was a contributing factor to the "near-insolvency" of Stombuco by the end of the 1880s. I suspect that this may have been the reason that the verandahs were not fully completed.